The Bellingham Farmers Market is opening their Fairhaven version, the Wednesday Market on the Fairhaven Village Green, behind Village Books from 12 noon to 5pm. 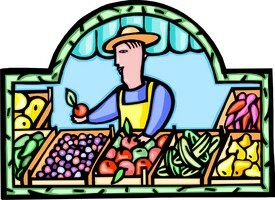 The market runs every Wednesday from June through September. A great place for lunch and seeing over 25 vendors selling everything from fresh produce to fine jewelry, colorful flowers and flags. There’s always lots of live entertainment. Come on down for a picnic on the green, get lunch or ingredients for dinner or see some friends. This entry was posted in 365 Things to do in Bellingham and tagged 365 Things to do in Bellingham, Farmer's market, Flowers, food. Bookmark the permalink.